The monastery is very remote, so please call for directions. The Liturgical language used at the Monastery is English. 5:30 AM Matins and First Hour. 5:00 PM Ninth Hour and Vespers. Protection of the Holy Virgin Monastery was established with the blessing of His Grace, Bishop Tikhon in October of 1993. The changing demographics of the US led the sisters to feel that the Rocky Mountain region would not only be an area conducive to the life of prayer, but would also be fertile ground in which to plant a monastic community. The sisterhood, having no funds of their own, first rented a small house in the prairie town of Calhan, located east of Colorado Springs, until they could raise enough material resources for a down payment on a piece of land. The search for a suitable site led the sisters to the mountains west of Pikes Peak where 10.3 acres with a 3000 square foot house was found for a price of $150,000. This was purchased through a bank loan in 1995. 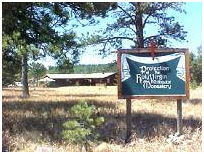 In 1999, an additional 3.5 acres of forest land was added to the monastery. The Monastic Community is presently very small, however there is ample room in the buildings to house more sisters. The somewhat rugged life and remote location is better suited to younger, rather than older, women seeking the monastic life. Having moved onto the permanent site for the monastery in September 1995, the sisters converted the existing building on the property to better suit the needs of a monastery. The attached garage was remodeled to be a small chapel which has served us well. At present, we are beginning a plan for a free-standing church. This will take 5-10 years to accomplish since we do not want to be burdened with a mortgage. In 2002 a small guest wing was added to the existing structures. However, accomodations are still very limited and cannot accomodate small children. Anyone desiring to spend the night MUST call before coming. The sisters strive to support themselves through mounting icon prints, making prayer ropes, speaking at retreats and conferences, as well as writing and publishing. Published works to date include “Orthodox Prayer Book”, “Come, Follow Me”, “The Life of St Spiridon”, and “Edler Cleopa: In the Tradition of St Paisius Velichkovsky”, and “The Tumbled Stone”, a childrens book written and illustrated by Claire Brandenburg. The Monastery newsletter, “The Veil” is published three times a year. The number of titles from other authors in the Monastery book/gift shop is growing daily. A bookstore catalog is available upon request. The sisters manage to raise a small garden in spite of the 9000’ elevation and short growing season. Our small flock of hens have brought neighbors to the monastery to purchase fresh eggs. At present, the Monastery does not have a resident priest. It is the hope and prayer of the sisterhood that a retired priest may decide to move nearby and serve at the Monastery. The Monastery is not on-line, however those interested may contact the nuns ar 719-748-3999 or by mail at PO Box 416, Lake George, CO 80827. Mother Cassiana is presently the acting superior.